Colton Haynes may be getting up close and personal with koala bears while filming "San Andreas" in Australia, but co-star Dwayne "The Rock" Johnson, who is also filming the new movie Down Under, is more of a fan of the water! The muscular actor posted a photo of himself on a Jet Ski in Queensland on April 28 with the caption, "Roads? Where we're going, we don't need roads...#KissMyFluxCapacitor #GoldCoastRidin." The 41-year-old actor started filming "San Andreas" last week. Since the former professional wrestler arrived in Australia, he's been hitting the gym hard and it's certainly paying off. 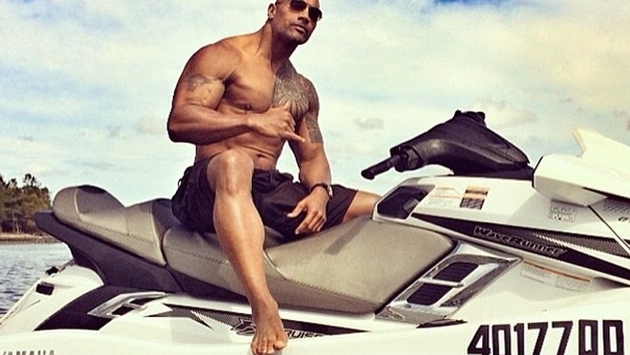 Wearing nothing but board shorts and sunglasses, The Rock's insane body was on full display. The day before this photo was taken, Dwayne uploaded a picture of himself in preparation for a workout. He wrote, "Sunday mornin'... I know on the 7th day he rested, but pre-workout drink is kickin' in and we gots to train.#BroomstickOnTheThrottle #GodApproved#SweatEquity #IronTime." We must also note that following a 22-hour flight from Dubai, The Rock's first order of business was to find a local gym in Australia. Clearly, The Rock is always focused on staying healthy and fit, even if he's currently residing in one of the most beautiful places on Earth. His new movie, "San Andreas," tells the story of a helicopter pilot attempting to rescue his daughter after an earthquake hits California.